Here on the Isle of Man, everyone is entitled to an annual eye examination, paid for by the Isle of man Government. This check involves a vision assessment, and the assessment of your ocular health, including if necessary a peripheral vision check (sometimes known as a visual fields assessment), and an ocular pressure test, which many people remember as a basic test for glaucoma (a serious eye disease). 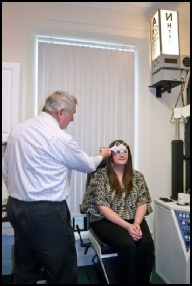 As a practice that invests heavily in specialist equipment, we are able to offer an enhanced eye examination which utilises equipment that expands our scope for early disease detection and management. Through use of this specialist equipment we are more easily able to detect early signs of health complications that include diabetes, hypertension, and raised cholesterol levels. We are even better placed to detect the warning signs of early cataracts, glaucoma, macular degeneration and retinal holes and tears.